In this article we are going to cover the Database current size, auto growth setting and file location. 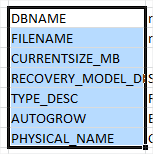 How to Find database current size, auto growth setting and file location? Hope you will like the Database current size, auto growth setting and file location.